There are many idiots in BN. Isa Samad, aka PENDEK, is one of them. Where was Pendek last Friday when God was giving out brains in Jalan Seamarak? 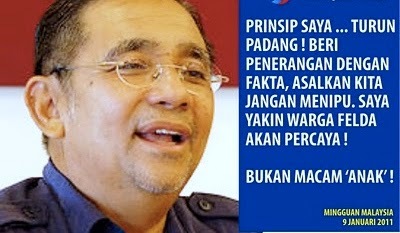 Opps I forgot, he has been sacked as Felda’s Chairman. He sure needs some grey matter in that cranium of his. Anyway, let me story him about why it no longer matters if he “ada kaitan atau tidak dengan Felda” when PH is in government. What Pendek have wrecked upon Felda. with or without “help” from that Idiot who put him there, has costs Felda and our country billions of Ringgits – literally! How has he done it? Let me count the ways…. FWC Felda Wellness Corp Sdn Bhd : Loss RM154.75 million. Felda Caviartive Sdn Bhd : Loss RM47.6 million. Global Settlers Sdn Bhd : Loss RM8.4 million. Lidar Services : RM40.57 million paid for deliverables not fully received. Hotels bought in Port Dickson and London to benefit Isa’s son and friend. Projek Rumah Generasi Kedua Felda : RM1.4 billion. Iris Corporation Berhad : Purchased RM192 million. Now worth RM72 million. Barakah Offshore Petroleum Berhad : Bought RM100 million. Now worth RM48 million. What he has done as Chairman of Felda is treason because causing the financial ruination of our Nations, if not the World’s, largest Oil Palm producer, is economic sabotage of our nation’s economy. The punishment for treason is death. So Pendek, your “kaitan” with Felda stays and all the millions of Pounds you and your wife have stashed away in your London bank account is not going to do you any good once you are convicted of grand theft and treason! 2) Allowed his agents to pay various amounts of money to delegates from the Cameron Highlands, Kuala Lipis and Bentong divisons to the Umno General Assembly on 11 September 11. 3) Allowed his agents to pay RM1,000 each to delegates to the Umno General Assembly at the Crown Princess Hotel at 11.00pm on 22 September and the morning of 23 September. 4) Permitted his agents to pay RM1,000 each to delegates to the Umno General Assembly at or about 1.00am on 23 September at the Pan Pacific Hotel, Kuala Lumpur. 5) Allowed his agents to pay various sums of money to Sabah delegates to the Umno General Assembly at about 1.00am on 23 September at the Legend Hotel, Kuala Lumpur. 6) Allowed his agents to pay RM300 to Sabah Umno delegates at the Tanjung Aru Golf Club and the ‘Kandarah” Court, both of which are in Sabah in early September. 7) Allowed his agents to pay RM300 to Kedah Umno delegates at Holiday Villa Hotel, Alor Star and Kelab Cinta Sayang, Sungai Petani around two to three weeks before the 2004 Umno General Assembly. For all that he was suspended for six years and compelled to give up all his positions in Umno including that of Vice-President of Umno. Well Pendek is going to be facing more then seven corrupt charges. Hell I am even sure that not only will they charge him with more then seven charges of corruption….. he will he be spending more then seven years in Sungai Buloh. That is if they do not shoot him first for treason.